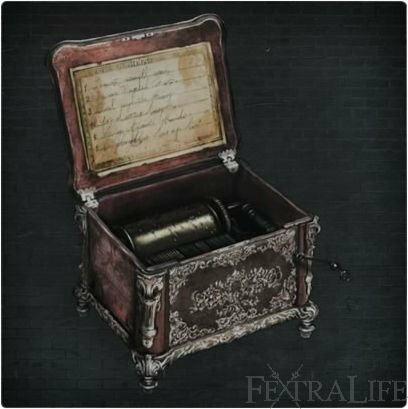 Tiny Music Box is an Item in Bloodborne. "A small music box received from a young Yharnam girl. Plays a song shared by her mother and father. Inside the lid is a small scrap of paper, perhaps an old message. Two names can be made out, however faintly, Viola and Gascoigne." When used in the fight against Father Gascoigne, it is possible to trigger the beast phase of the fight before he gets to one-third health. Human Gascoigne also staggers, when he hears the box's music. Using the box during the Beast Phase will also stagger him, giving you a chance to use your Molotov Cocktails. Quest item/gift from Gascoigne's daughter, next to the shortcut gate to the sewers from the plaza in Central Yharnam. Gascoigne's daughter will give you the music box. She gives you the music box after or before you defeat Father Gascoigne. Using the music box when you have Gascoigne summoned will cause him to chuckle. He only does this the first time he hears it. After Gascoigne is defeated, a red brooch can be returned to his daughter which will complete the quest. Refusing to give her the brooch will also result in this quest-line's completion. The song heard is a short clip from the Mergo's Wet Nurse boss theme. Seems like using the box near smoke areas it will clear the area. It also distracts Rom if you play it in his boss fight. Easter egg; If you wait and listen at the bottom of Gascoigne’s house, you can hear the entirety of Mergo’s lullaby playing from the house. The music box easter egg, where he laughs if you use it while he is summoned, doesn&apos;t appear to work anymore. Tried several times on different characters, but he won&apos;t react. The quest isn&apos;t over though? I went back to the window after giving the kids the brooch and the window was dark; no response. I returned again after fighting Rom and the light was lit again. Someone saying their little sister was missing. "Look for a little girl with a big white ribbon. My good little sister..."
I haven&apos;t seen anything more but there&apos;s got to be more, right? Even something morbid like finding a little dead girl? I spammed the music box using the quick item slot in the Cathedral Ward, and after spamming it for a while I heard some unseen person laughing before the music began to grow ominous- like any sane person, I promptly ran off to the Hunter&apos;s Dream, but can someone please confirm that I was not hearing things? I&apos;m wondering how Gascoigne and Mergo may be related. Not necessarily blood related, but there seems to be a connection of some kind. The music box says it "Plays a song shared by her mother and father." Referring to the Gascoigne and Viola. The song that they share is called Lullaby for Mergo in the soundtrack though and is the Wet Nurse theme. Why is Gascoigne and Viola&apos;s song Mergo&apos;s lullaby? This page should have the audio clip from the Music Box and provide a link if possible to audio of the Winter Lanterns&apos; singing and the Wet Nurse theme. If you activate this item in chalice dungeon rooms where there is a big bell, it will actually ring the bell just like it would if you were to hit the bell. I heard using the tiny music box after defeating Mergo&apos;s Wet Nurse whilst the baby is crying will instead make it laugh. Has anyone done this to confirm/deny the occurrence? Could tie in to the music box playing a similar tune to Mergo&apos;s Wet Nurse theme. I wonder if there&apos;s a lore connection between the music box and Mergo...I don&apos;t buy that it is just a coincidence. That is to say if you fail to kill him in one life will it be used up after a certain number of uses?